From all of us on the development team, We would like to thank the brave knights exploring Happy Dungeons. 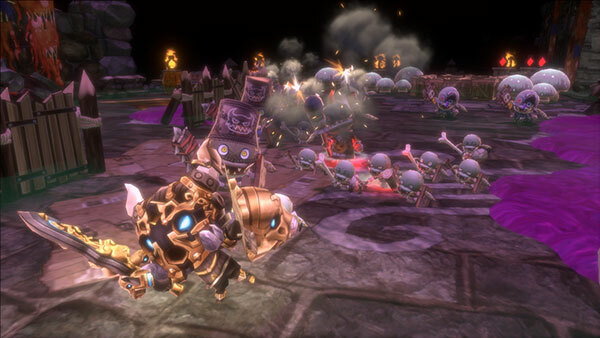 The December update is drawing near、bringing Happy Dungeons one step closer to our ultimate vision. Below are the latest additions to Happy Dungeons. Our new central game mode, Infinite Dungeon, will provide you and your pals-in-arms with a procedurally generated dungeon that never fails to surprise, no matter how many times you pay it a visit! Also, if you’re feeling a bit outmatched, feel free to use our latest feature, the Magic Elevator. Rather than selecting the difficulty at the beginning, the dungeon will grow more challenging as you dive deeper into its depths. Of course, the harder the challenge, the riper the rewards, and Infinite Dungeon proves no different as rarer items and buffs can be found the deeper you go. Now, only the opening few levels are open while we adjust, polish and feed the happy horrors awaiting in the lower levels. Prepare yourselves for all the challenges your knightly heart can take! The Infinite Dungeon was originally a prison created by the founder of the order of knights to hold the countless enemies of an Ancient King. If we have the chance, we’ll try to release the background story. Oh boy does that feel good to say! Brand New items known as Awakener Items are scattered all throughout the Infinite Dungeon just waiting to be collected. Awakener Items are that allow you to use your equipment item’s Awaken Item ability to power up and will increase the item’s attack and defense power and maybe even its rarity! Within the Infinite Dungeon, you can expect not only some of the most powerful equipment items in the game, but also a series of equipment items with never-before-seen abilities! These items won’t be available elsewhere in the story, nor will they appear in Happy Cards card packs. The Infinite Dungeon exclusive equipment items can use Awaken Item multiple times to grow even stronger. However, for now, the initial series can only be found on the middle floors. Eventually the deeper floors will also hold new series of equipment items as well. Now I bet you’re wondering just what kind of items you’ll find in the Infinite dungeon. 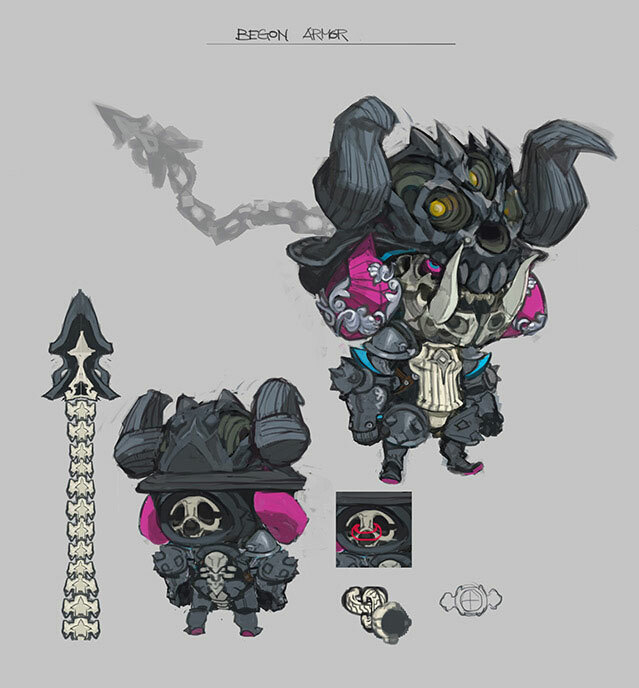 Let’s take a look at some of the concept art! I’m sure many of you remember these. The first equipment items that every player gets are stronger than ever when powered up by the Awakener items found in the Infinite Dungeon! Anyone can obtain the Awaken Item boosted Starter weapons thanks to the Awakener Items found in the Infinite dungeon. We’re still working on this Warrior only equipment series. The method for obtaining them is also a secret. On an unrelated note, the monster behind the Happy Dungeons title screen logo is called Bagon. 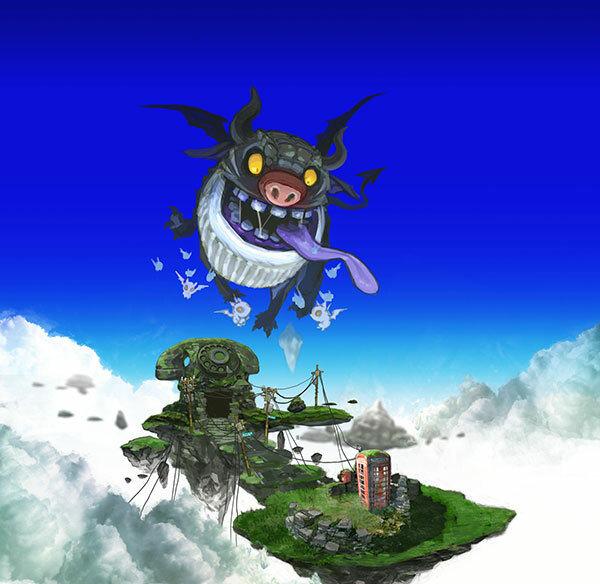 Beros (the black dog) from Happy Wars who is the child of Ragon (the white dragon) is the god of the world of Happy Dungeons. In addition to Infinite Dungeon, new equipment items and Awaken Item, we have also added dungeon search giving players more ways than ever to obtain valuable items. We’re still putting the finishing touches on everything, so we ask for your understanding as we work towards pushing out the December update.